Get Smooth Legs for Summer! I’ve been toying around with the idea of waxing my legs for a few years, but I finally decided to bite the bullet and try an at-home waxing kit. I was always nervous about it because my skin is sensitive, and I thought waxing would make it worse. But my sensitive skin always makes me get bright red and itchy razor bumps on my legs when I shave, and it’s just unbearable. I finally decided that even if my skin flared up with waxing, I would have A LOT more time to let my skin relax before doing it all over again, which in the long run seemed a lot more pleasant. After browsing the options, I went for the Sally Hansen Ouch Relief Wax Strip Kit. 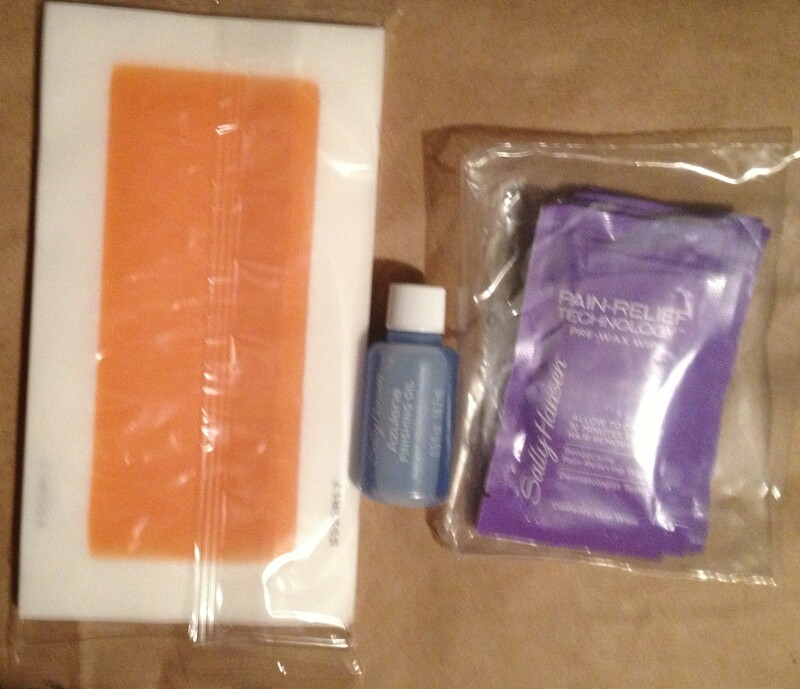 It comes with 32 wax strips, 4 pain relief pre-wax wipes, and a small bottle of azulene finishing oil. Now, I didn’t buy into the whole “painless” thing—I mean, you’re still ripping our your hair by the roots, so it’s gotta hurt, right? But I figured it was worth a try, to see if it really did make it less painful than expected. I decided to spare you the step-by-step photos (you’re welcome), so you’ll just have to trust my descriptions here. Here’s how the kit works! The hair should be about 1/4″ long (about three weeks without shaving). This makes it so the wax has enough to attach to when you press on the strip. The package says to wait at least an hour after showering before using this, which surprised me. I thought that after a shower my skin would be more relaxed and it might be less painful. I’m not sure what the logic is here, but I trust it. Make sure your legs are dry and clear of any lotion or soap residue. The first thing you’ll want to do is rub a “pain free” pre-wax wipe all over your legs and wait ten minutes for it to set. I was able to use just one for both legs, but if you want to take more time and be precise with it, go for two. Once your legs are dry again, figure out your action plan. This is honestly the hardest part about using this kit. I just went for it and it felt like I was doing a puzzle on my leg. By the end I was cutting the strips into tiny pieces to get the spots I missed. Don’t be like me. Plan ahead. Take a strip and rub it between your hands to warm up the wax. This part can be a little awkward because it’s hard to get a grip on the waxy paper, so what worked for me was to leave one hand stationary and rub the other hand over the strip. Peel the strip apart and put one half aside. Lay your first strip onto your leg in the direction the hair grows and press it down. I rubbed it down my leg a few times to make sure I didn’t miss any spots. Lay the other side of the strip on the next area and repeat. Keep doing this until you’ve waxed every inch! Once your leg is done, put some of the azulene finishing oil on a cotton ball and rub it over your legs, being sure to get any leftover wax off. By the time I was done with both legs, I had used 30 of the 32 strips and my legs were starting to turn red. I got some bumps, but they were bigger and less irritable than razor bumps, so I knew it was just a temporary flare-up. My legs felt a bit too itchy and oily from the finishing oil, so I quickly rinsed my legs with cold water and patted them dry. Don’t put any soap or lotion on them right away, because your skin will be raw and may react differently! I had dinner and relaxed a bit before taking a shower and using a little bit of mild soap on my legs. My skin was still a little red and bumpy, but by the time I woke up the next morning, my skin was perfectly normal! I was able to get back into my regular skincare/lotion routine the next day. I absolutely recommend this to anyone else who’s sick of razor bumps! After the initial flare-up, my legs have never felt smoother. It’s so nice to not have to worry about shaving and dealing with razor bumps, especially in the summer when I’m constantly switching from pants to dresses to shorts. My only issue really was making sure I didn’t miss any spots without wasting the strips. It was impossible for me to see the back of my leg, let alone get the right angle to pull the hair all the way out, so I did my best and went back with tweezers afterwards to pluck any strays. After a few days, though, I felt some patches growing back, meaning I didn’t quite pull the hair out from the root. I do see the benefit of getting this done professionally in a salon, but for about $8, this is definitely not a wrong choice! I think I’ll just take a little more time to plan it out next time, or awkwardly ask someone to help me. Have you tried waxing at home? I’d love to hear your experiences!